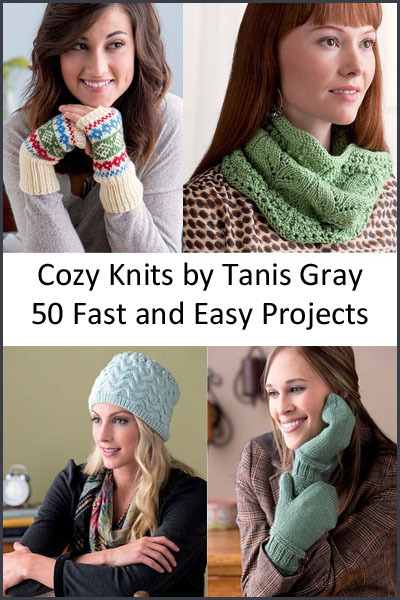 Cozy Knits from Tanis Grey has 50 projects to keep you knitting all winter long. Whether you need a quick birthday gift, a new hat to match the coat you got over the holidays or you are determined to get a head start on your gift knitting for NEXT year, you’ll likely find what you’re looking for here. With projects that range from hats and mittens to simple sweaters and adorable pieces for baby, you’ll find yourself knitting up colorful and interesting projects in no time. 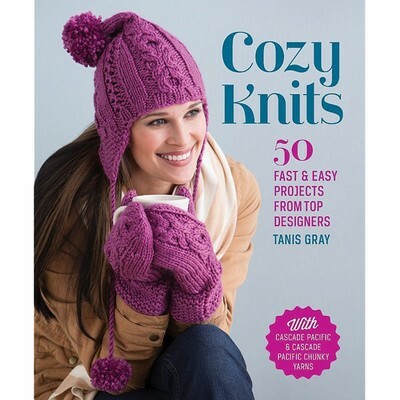 Leave a comment below and tell us about your favorite quick and cozy knit project and you could win a copy! All comments must be posted by 11:59pm EST on Tuesday, Dec. 31. Please make sure to leave us a way to contact you if you win! The winner will be drawn randomly and posted here. Congratulations Debra! Keep an eye on your inbox, we’ll be contacting you soon. Sara learned to knit and crochet as a child and added spinning and weaving to her skills after being hired at WEBS in 2006. While crochet is her #1 love, she is also very fond of her husband and their 2 daughters. This entry was posted on Friday, December 27th, 2013 at 11:00 am	and is filed under Authors & Designers. You can follow any responses to this entry through the RSS 2.0 feed. You can skip to the end and leave a response. Pinging is currently not allowed. I discovered late in 2013 that I love making hats! They’re so quick and stylish! My favorite quick and cozy knit or crochet project would be a hat as they are useful for gifts even here in Florida. Quick would have to be dishcloths – but cozy? that would be scarves. Everyone loves a soft, squishy scarf when the wind is cold. I made my DD a hat that was quick and easy a couple of winters ago and she still loves to wear it. Other than that, scarves & cowls are my go to quick and easy and very portable projects. Matching cowl and fingerless mitts in bulky wool makes everyone happy in a hurry! I especially like the climbing vines cabled leg warmers! Any cowl or fingerless mitt pattern will do! My quick knit, go to project this season has been cowls. I do love a cozy hat or a cozy pair of mittens, but I’ve been obsessed with cowls lately. What a great way to get next years Christmas knitting done! I love making hat. I have a few days off, I already make four hats for the family, quick and easy, and fun too! Cowls and scarves are a great quick project to stay cozy and warm! I just made the Quick Slip Cowl. Love the Berroco Brio yarn and the instant gratification of a quick project. I love making scarfs, hats, cowls. I just love to knit. I made a cowl late last winter in Cascade Eco+ that I’ve been wearing a lot lately. Very soft and warm, and the shade of blue is beautiful. I have enjoyed making cowls this year in a variety of yarns and colors ordered from Webs. I had lots of happy friends with the handknit cowls that I gave them for Christmas. And I even kept a lovely one for myself. Cowls are my favourite cosy project – and often make for a quick gift, esp since winter seems to last so long here :). I love making baby items because they are always soo cute! I also love making cowls and fingerless mitts for me. I think cowls are a nice quick project and what could be cosier than something you wrap around your neck? Hats 7 Scarfs or cowls are my quick projects! Hats are definitely my fun quick projects! Hats, FTW! @Brenda Barnes on Twitter. Wrist Warmers. Basically just a tube with a hole for the thumb. Quick, cozy and they make great gifts. For me its been fingerless mitts. Mittens and hats have been m go to quick knit gifts. But I would love to get into cowls and the one in here looks perfect. Fingers crossed!! Hats are the best quick project. I love knitting hats and mittens! The green cowl pictured would look lovely in a bamboo blend I have stashed! My absolute favorite quick knit is a hand warmer pattern I’ve adapted over many uses. The original is knit flat and seamed but I prefer to knit them in the round, and I also added a detail of a thumb (rather than just a thumb hole- thumbs get cold, too!). It’s simple to adjust the cast-on and rib to any yarn. Knitting up a pair is an easy couple of hours and a sure-to-please gift! © 2005-2013 All Rights Reserved. WEBS® and Valley Yarns® are registered trademarks of Valley Fibers Corporation.